Just a quick, short post today. I've just been trying to get back in the swing of things with school. And to be honest, I have not been doing a very good job. At the end of every day, I sit and wonder where the day has gone. It's a vicious cycle. It's sort of like baking with herbs, minus the viciousness. I bake one dessert with herbs and then, BAM, it seems like every dessert I make has herbs in it. Ugh, it's so hard to stop with so many flourishing fresh herbs at my disposal! When I saw a version of these bars over on Smitten Kitchen, I immediately knew I needed them in my life. I mean, they're friggin pink y'all. And they sounded just like summer! Lucky for me, they taste just like summer too. I added thyme to the crust and used strawberries instead of raspberries in the filling. Every time I buy raspberries here lately, I find them to be too tart, and I wanted a bit of sweetness to balance out the lemon. 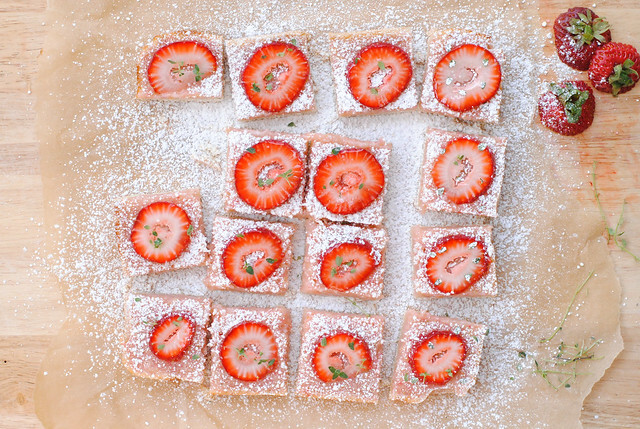 To finish them off, I topped each bar with a fresh strawberry slice and a sprinkling of thyme. So there you have it. Pretty. Simple. Delicious. Preheat oven to 350 degrees F and line an 8x8 baking pan with parchment, leaving enough of an overhang to lift from the edges. For crust. 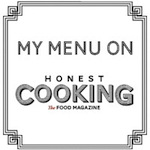 In a small bowl, rub the sugar, thyme, and zest together until fragrant. Add more thyme if you feel it needs it (give it a little taste if you need to!). 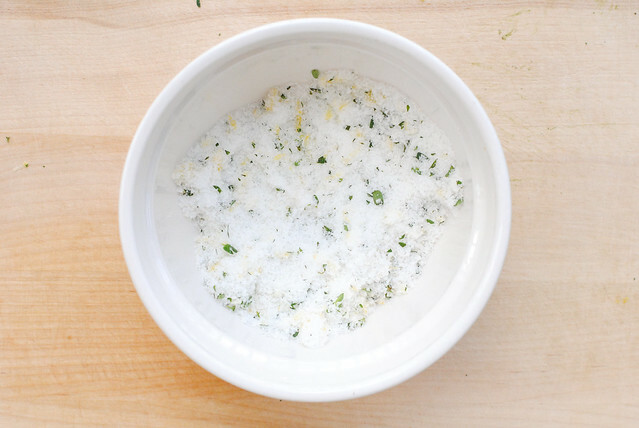 Transfer the herby-lemony sugar to a food processor, add the salt, and pulse a few times. Add the flour and pulse until mixed in. Sprinkle the butter evenly over the top of the flour mixture and pulse until the butter is evenly distributed and the mixture comes together. It should be a bit crumbly. Press the dough into the prepared pan and slightly up the sides. Bake until lightly browned around the edges, about 15 minutes. Let cool on a wire rack. For filling. In a medium bowl, whisk together eggs, sugar, lemon juice, and puree until smooth. Stir in flour. Pour into cooling crust. Bake until set and slightly golden at the edges, about 25 to 30 minutes. They should jiggle ever so slightly when done. Let cool on wire rack 15 minutes then transfer to fridge to cool completely. Once cool, slice into bars of a size of your choosing. Dust with powdered sugar. 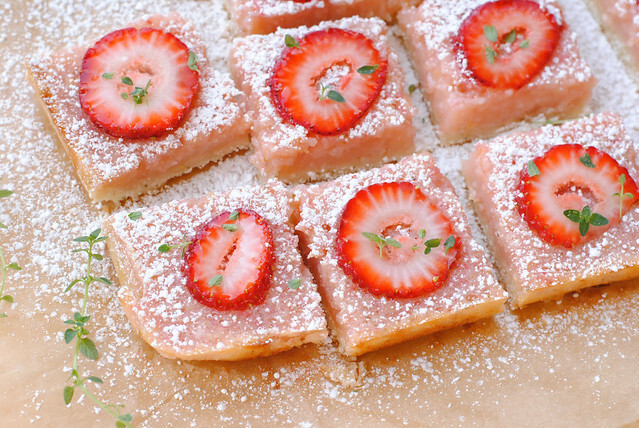 Top each slice with a strawberry slice and sprinkle of thyme before serving. Bars will keep stored in an airtight container in the fridge for about a week. Oooo yes, dainty and delicious are great ways to describe these too! Thank you! 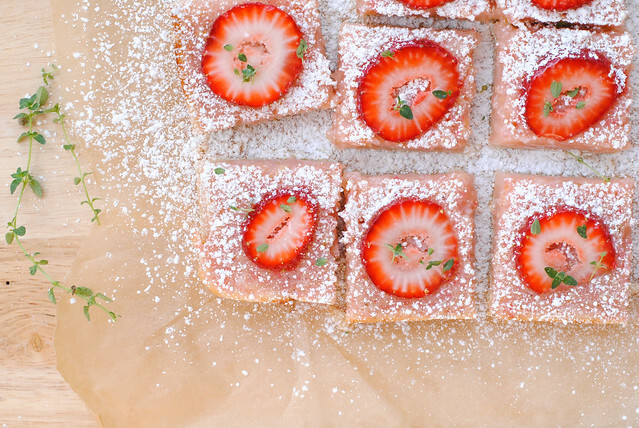 Oh, I love how sweetly pink these are without any food coloring. I'm bookmarking these for Thanksgiving time, because I'm thinking the thyme + lemon combo would be delicious with cranberries too.